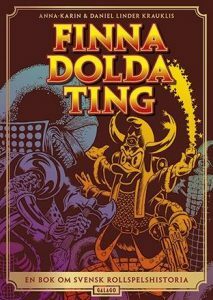 ‘I Finna dolda ting utforskas de svenska rollspel som skrevs från 80-talet och framåt. Boken luskar i moralpaniken på 90-talet och ger alla gamla rollspelare en rejäl nostalgitripp tillbaka till en tid då de såldes i vanliga leksaksaffärer, och alla ungar spelade Drakar och Demoner i sin källare. 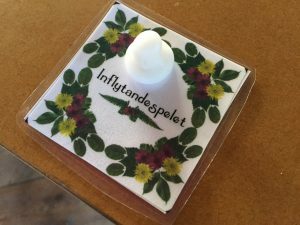 Boken innehåller intervjuer med spelkonstruktörer, vintagebilder, nya fakta och en rejäl genomgång av Sveriges rollspelsskatt gjorde dessa dyrgripar verkligen folk till satanister, eller snarare till driftiga entreprenörer som använder sina kunskaper i karriären? I co-wrote this book with Daniel Linder Krauklis, and it’s about Swedish roleplaying history. It came out 2015 at Galago and was well received. It is one of the first books written about Swedish roleplaying history and culture, with a lot of old pictures, news articles and voices from the last 35 years of Swedish roleplaying in it. We met with a lot of people who were in the industry back in the day, dove deep into archives and got hold of rare radio snippets from the dark days of moral panic in the 90s. It was a lovely and sometimes huge challenge to write. Gräv! (Dig!) 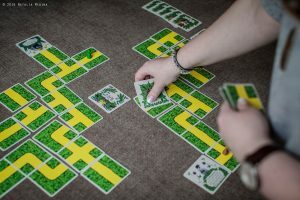 is a card game that is part of an educational method material published by Ax – Kulturorganisationer i samverkan och Sverok. 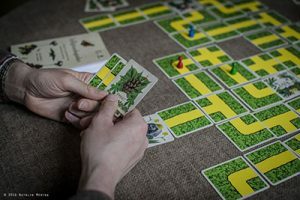 The game is a co-op game where the players play rabbits, and they build the board while playing. They try to get to the goal card without being eaten by the hungry fox that chases them. After the game is done, there are questions to be answered about how the team collaborated in the quest to get all the players safe to the goal. The game is meant to be a an opener for discussion about power and influence and collaboration in organisations.